With more than 12 million users across the globe, eharmony guarantees you a successful search process first by virtue of the site's sheer size and secondly because of their specially developed relationship questionnaire, which promises to accurately find your match based on its 29 Dimensions of Compatibility. This unique personality profile is backed by 35 years of clinical research by Dr Neil Warren and matches people on the basis of factors such as character, energy levels, intellect, and family values. Other sites may get you dates, but only eHarmony promises harmonious love. You might be sceptical that a computer can match you with your perfect partner better than you can, but believe us, the innovative and in-depth Book of You which you receive is worth the questionnaire even without the matches! Many online dating websites take seconds to sign up to, and then consume hours of your time thereafter while you search for the One. eharmony offers a revolutionary attitude to online dating, turning this expectation on its head. Sign up is lengthy, with over 400 questions to answer, but once this initial time has been spent, eharmony do the rest of the leg work. Questions come in a few types, most taking only seconds to answer, and some needing a little more thought. Choose from pre-set options to declare your education, employment, religion and physical attributes, and then go on from there to some more probing questions. These are innovatively designed to uncover features of your personality, and involve you ranking yourself by descriptions or adjectives on a scale. Once this section is complete, you can be as descriptive as you like in some interesting free writing questions which give you an opportunity to share more about what you are passionate about. Be honest, as you have nothing to gain by holding things back, but remember that some room for curiosity is a good thing! After this, you will be able to describe what you’re looking for in a match, including deal breakers and expectations in both physical appearance and lifestyle choices. All of your information will be used to scientifically find you your most compatible matches from the millions of users on the website, but can also be looked at in the Book of You, helping you discover more about yourself than you could imagine. 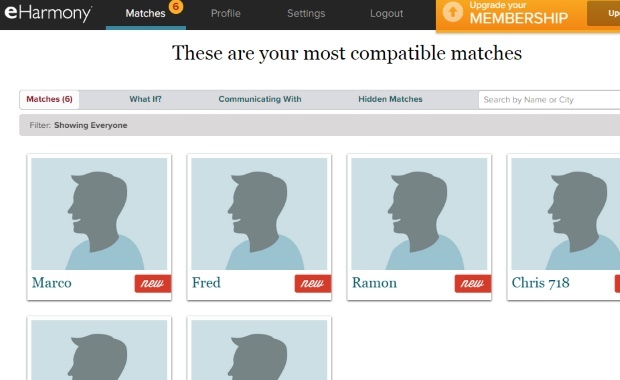 View and add to your own profile for matches to see from the eharmony home page. This is both stylish and beautifully designed, helping you show others the best of yourself. Take your time completing it, it should be fun! eharmony takes over from this point. You will receive daily matches directly to your email inbox as well as on the messages section of the website, which is easy to navigate. The website itself is minimal, as there are no profiles to search through yourself other than your matches. This makes it an excellent choice for anyone less tech savvy, as well as those more experiences. Helpful tips and tricks are shown often at the start to help find your feet with the various toolbars and options, so that you don’t miss out on any functionality. Simply sit back, and start communicating with your matches, all of whom are pre-verified for compatibility. If you would like a little more control over who you see, or more choices, The What If service allows you to browse additional profiles. Additional features include a Premium Book of You, to really understand more about yourself, identity verification through RelyID, and options to see when matches were last online as well as speak via a secure phone line. This last feature is especially useful for any user who is nervous about moving to face to face contact without speaking first. With such an investment in getting to know you and what you’re looking for in a mate, you can expect to pay a little more at the outset. As a premium matchmaking service, the eHarmony prices are higher than some other dating websites we’ve tried, but we believe this is for a good reason, and they are well worth the initial outlay. As with many websites, the longer you sign up for the cheaper your subscription will be. Sign up for 2 years of membership, and your monthly cost can be as little as £5.95. 12 months may seem more manageable a time period to you, which is still a bargain for £12.95 per month, and saves you over 70% from the full price membership. Choose to commit for 6 months, and this will cost you £18.95 per month. If you want a shorter term subscription, you can choose 3 or even 1 month, which is £36.95 per month or £44.95 respectively. eharmony may in fact be one of the safest ways of dating online, as you do not approach profiles yourself, and can enjoy having matches from pre-vetted profiles presented to you, without fear of scams or malicious intent. In fact, the website itself is not really set up for anyone who is not serious, as a result of the lengthy sign up process! However, you will still find a dedicated safety tips page which allows you to read up on keeping yourself safe both on and offline. eharmony is serious about commitment minded relationships, and offers unique scientific personality profiling to get you there. The beautiful Book of You was enough to catch our interest, and the gorgeously designed profiles and sleek design make the website a pleasure to use. We’re hooked!